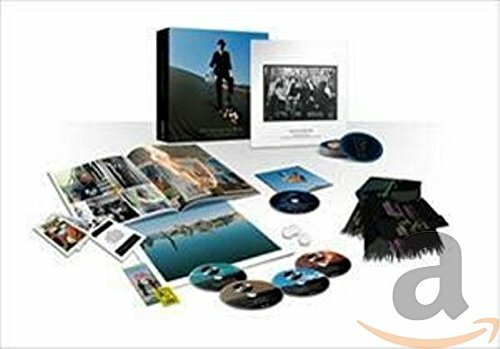 With only a little over a week to go until the reissue of Pink Floyd’s Dark Side of the Moon as a 6-disc Immersion Edition (as well as the Discovery Box and individual Discovery Editions) we thought you might be interested in sneaky close-up look at the packaging, courtesy of an empty ‘display-only’ box in a London record store. The detailed spec on the back confirms (finally) that the Quad Mix is definitely on the blu-ray disc, for those who were still worrying about this! The box is smaller than vinyl size. It’s approximately 11 inches square. For those in the UK this coming Friday, September 16th, BBC4 television are running ‘Pink Floyd Night’. This starts at 9:30pm, with the documentary ‘Which One’s Pink?’; 10:30pm sees ‘A Pink Floyd Miscellany 1967-2005’, a collection of restored and rare video clips; 11:30pm wraps things up with ‘Live At Pompeii’. More details here. Dark Side of the Moon Immersion Edition and all the Discovery Editions are released by EMI on Monday 26th September. 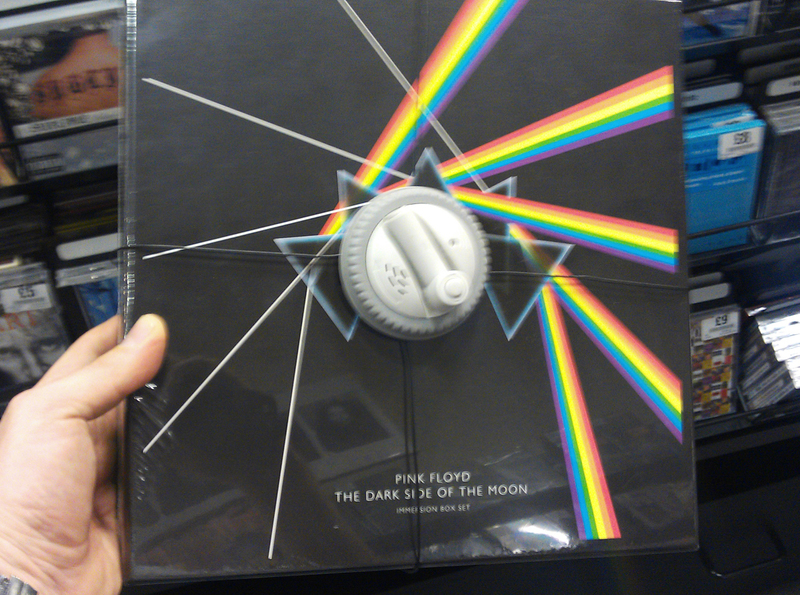 Order The Dark Side of the Moon Immersion Box by clicking here. It saddens me somewhat to read this as I’m now becoming more obsessed with the way my music sounds and want the best possible sound quality I can get. I figured if this big re-issue was going to be the last one, at least the company remastering the albums would do the best they could to get the most out of these original recordings and respect the music. You realise that article is about the old 30th anniversary and nothing to do with the forthcoming reissues? Also the SACD was superb. If you are obsessed with sound quality then you’ll likely have an SACD player and be blown away by the sound of the SACD. Why indeed? This is just depressing. Nice shots Paul, thanks for sharing. Any chance you could get some nice shots of the Discovery box, as well? Anyway, nice shots!